My two favourite prints deserve a separate post. 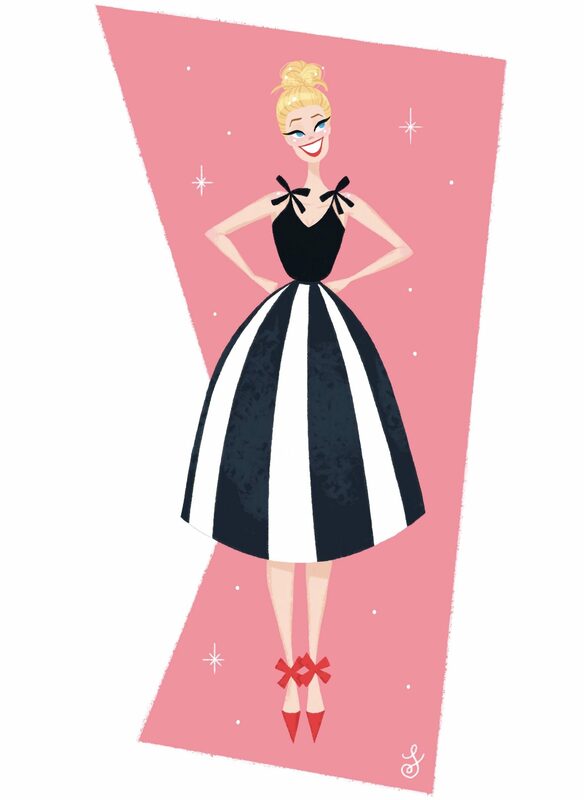 For me, skirts and dresses with stripes or polka dots are hard to resist. I also happen to be the proud owner of a ridiculous large collection of striped tops and sweaters. You would think that if you’ve seen one striped dress, skirt or top you’ve seen them all. But no: you have stripes in every form, shape and colour. Same goes for dots. I couldn’t pick a favourite stripe if I had to. Vertical is slimming, horizontal is cute and very French, diagonal is so unexpected. I could insert dozens of pictures here, but I tried to restrain myself. Let’s just say I like coloured stripes. A lot….. This dress has vertical and horizontal stripes in orange, black and silver. What more can you ask for? Dress is from Traffic People (shop here). Red stripes! Or are they white?? Dress is from Dolly and Dotty (this colour is sold out but in burgundy/black shop here). This gorgeous blue and yellow striped top is from Emily Lovelock (sold out). Baby pink and black. I bought this dress on sale at Joanie Clothing and was so happy they still had my size. I mean, baby pink and black….. (sorry, it’s sold out now). Polka dots are so girly but yet so stylish. And more versatile than you’d think. Of course the classic black and white (or white and black) dots are a style staple but why not try a different colour? First two are sold out, but similar dots skirt here. The green co-ord from Asos.com is one of my favourite purchases of last spring. And it has diagonal stripes, vertical stripes and dots! It’s still available and on major sale (here and here).